Have you noticed? 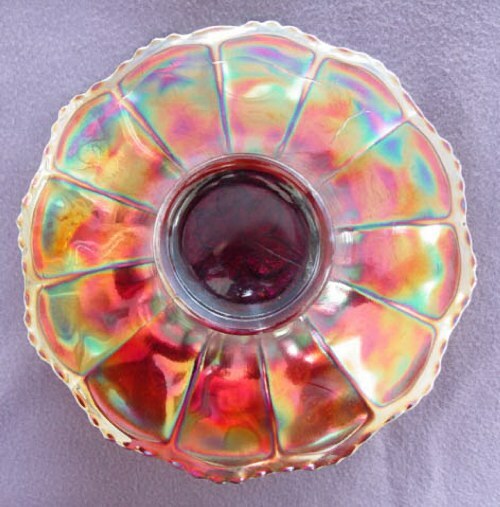 There always seems to be more required conversation/clarification surrounding carnival glass! 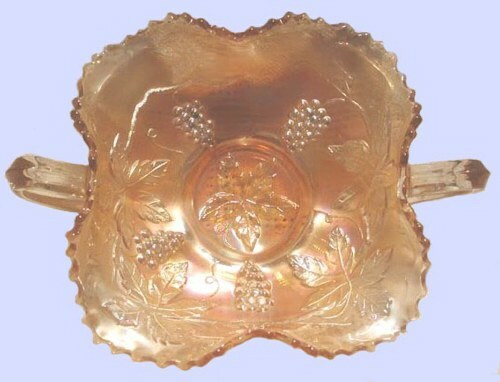 When Kate Lavelle contacted us with her two tri-corner Vintage pieces displaying stars within the marie, it became apparent that although we mentioned in Fenton Vintage - Part 1 that two items in that shape “had no star”; more needed to be explained about alternate use of various exterior molds. This may have occurred when an order was taken, with the customer stating a preference for use of the star or a plain marie. On the other hand: Many patterns display the paneled exterior. Perhaps to alternate wear between the two exterior molds, use was rotated from one “turn” (400 pieces) to another? At any rate, we decided to take photos of the six examples within our own collection, for comparisons sake. Another very real possibility: molds sustain damage/wear from the heavy wire brushes used to remove glass bits left clinging after the firing. Prolonged use requires mold replacement, perhaps “without” the star? Should you care to have a look at yours, perhaps we should mention that neither of our 9” blue or marigold plates display a star within the marie. 9” plates display 5 grape clusters. 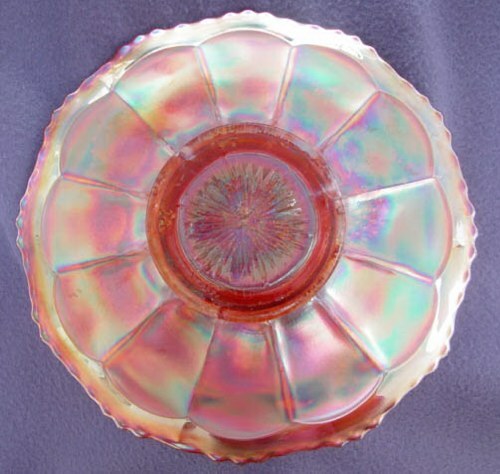 The Vintage pattern apparently was a huge success for Fenton, considering the various shapes found within the pattern. 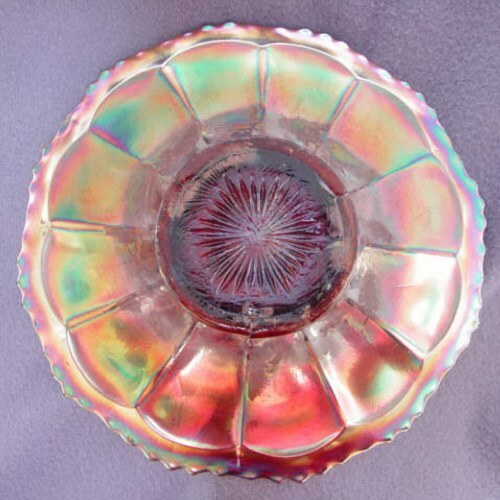 It was also used as the interior design of some Wreath of Roses punch bowls. It is virtually the same design as Grape and Cable, minus the cable. Compotes, 2 piece Epergnes, Centerpiece and Fernery bowls (ftd. ), and the handled Bonbon, along with a few Wine glasses (mgld. & ameth.) and a Spittoon whimsey in marigold. 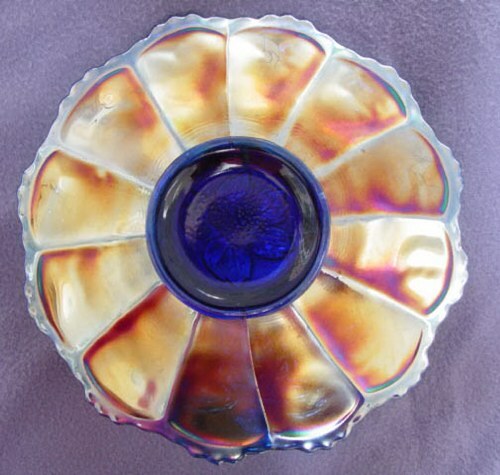 The Bonbon/Card tray shape is not plentiful, but is known in amethyst, blue, green and marigold. 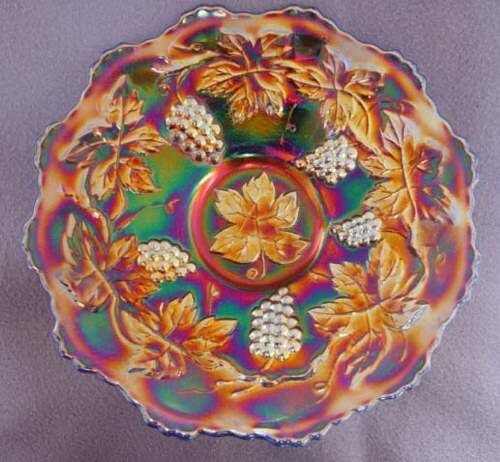 As you look at the design, you will note that although there are only 4 grape clusters, it is not the same design as found on the 6”-6 ½” bowls/plates, but an entirely different mold. The Fernery is found in amberina, amethyst, blue, green, marigold and red. Tri-corner whimsies of approx. 6” in size, are found in amethyst, blue and marigold. 6 ½” Vintage Plates are considered rare. There are 4 grape clusters displayed, with colors known in amethyst, green and marigold. 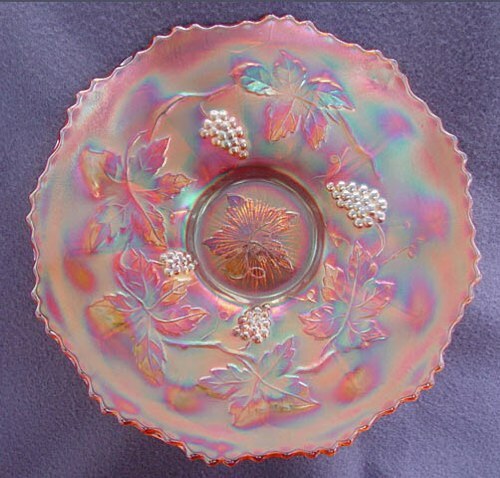 7 ½” Plates having 5 grape clusters are known in blue, green, marigold. Tri-Corner Amethyst and Marigold VINTAGE - frontal view. Tri-Corner Amethyst and Marigold VINTAGE - rear view. Amethyst - Amber 7.5 inch plate - No star - front view. 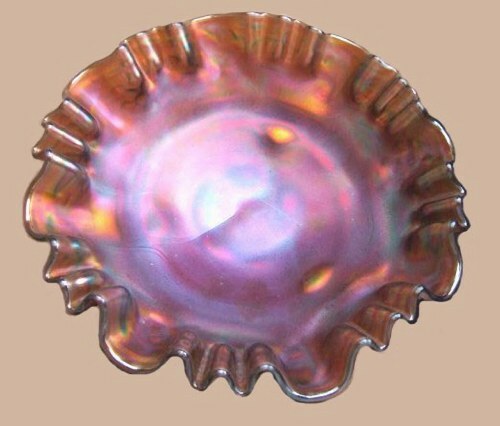 Amethyst - Amber 7.5 inch plate - No star - rear view. Blue plate with no star - 7.5 inch - front view. Blue plate with no star - 7.5 inch - rear view. 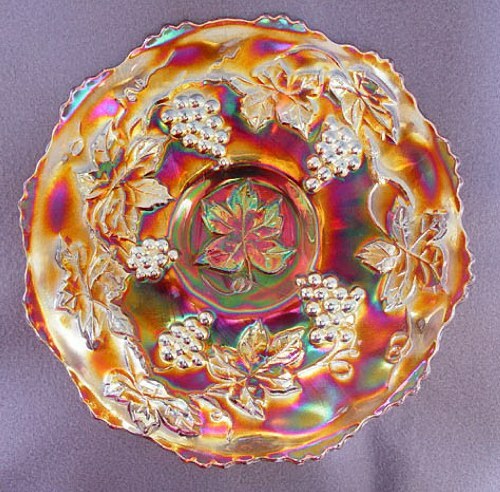 Marigold 6.5 inch plate with star - front view. Marigold 6.5 inch plate with star - rear view. 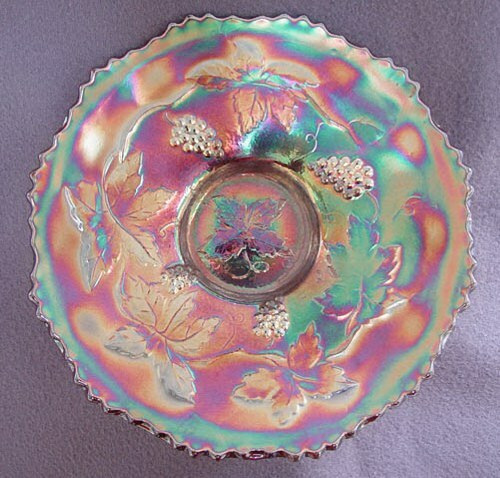 Amethyst 6.5 inch plate with star - front view. 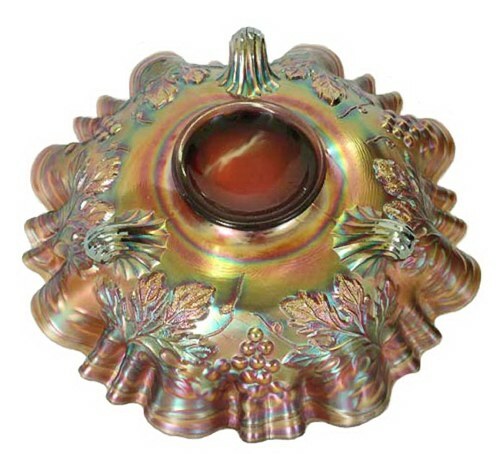 Amethyst 6.5 inch plate with star - rear view. VINTAGE Fernery interior - 8.5 inches across. Amethyst 3 and 1 edge former FERNERY - exterior. who do not walk according to the flesh,But according to the Spirit. do not walk according to the flesh but according to the Spirit. but those who live according to the Spirit, the things of the Spirit. So then, those who are in the flesh cannot please God. But you are not in the flesh but in the Spirit, if indeed the Spirit of God dwells in you.